I first became aware of (and a fan of) downhere with their single “A Better Way” from the Wide-Eyed And Mystified CD back in 2006. I was captivated by both the depth of the lyrical talent and the incredible vocal talents, provided by Marc Martel and Jason Germain. Martel gives downhere clean rock vocals while playing off Germain’s vaulting falsetto. The band is rounded out by Glenn Lavender on bass and Jeremy Thiessen (no relation to Matt Thiessen of Relient K) on drums. 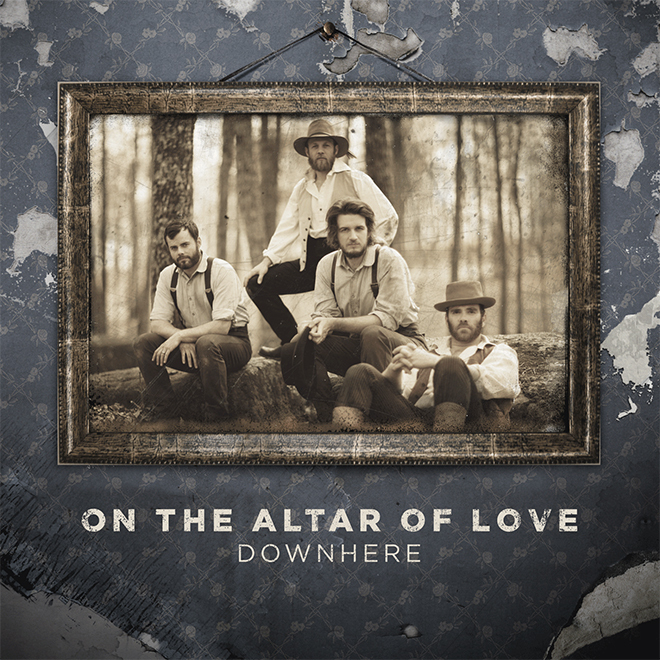 downhere is set to release their seventh release, On The Altar of Love, August 23rd. This alternative/rock/pop Canadian band was formed at Briercrest Bible College in 2001. That same year the band released their first CD, the self-titled downhere, after signing to Word Records. downhere has garnered a profusion of awards for the music industry. Nineteen Covenant awards, three Juno awards and one Dove award attest to the talent downhere offers. Stylistically similar to MercyMe and Casting Crowns, downhere surpasses their contemporaries on the crowded airwaves. Social commentary and faith issues take precedence on On The Altar of Love. The album takes the listener back to the basics of their faith and leaves you reconsidering what the priorities are in your faith. Overall this pop-friendly album gives a fairly singular feel with little variation in tempo or tone, the only exception being the rock driven “Seek”. Even though this album hasn’t provided any particularly exceptional tracks, such as hit songs “My Last Amen”, “Surrender” or “A Better Way”, it does have a number of solid tracks. “Rest” could easily be sung each Sunday morning at church. “Come to me, all you who weary and heavy-laden and I will give you rest” (Matthew 11:28) are quoted directly in the anthem song. Lyrically simple, the song speaks to all believers. A melodically beautiful piano into leads us into “Let Me Rediscover You”, the superior track on the new album. The lyricist laments his weaknesses and his yearning to be bonded to God in a profound way. Musically, the ’70’s return as downhere delivers the ultra-pop song, “Living The Dream”. I’m sorry, but I can’t get past the poppy, bouncy, music to appreciate the lyrics. “Seek” is the only rock based song found on On The Altar of Love. It describes how God seeks us “like a kid with a crush” to unite with Him. The title track carries a county music base. It tells us to lay down ourselves including our possessions and obsessions at the altar of love. “Love will ask of you more than treasure/When you’re willing to trust/Blessing far outweighs the loss/When you lay it all at the altar of love”. A good album? Yes, however my expectations have been placed at a high level after the previous, superior, albums. Should it be added to your collection? Absolutely.